If you missed our “Freedom Isn’t Free” workshop yesterday, we missed you! It was a great recovery experience. Our leader had so many great things to say, and in our next couple of posts, we will highlight a few resources and initiatives he mentioned in passing so that we can all learn more about them. what to do to get started. What a great way to learn about OA FAST! Watch the video so that you’ll understand the basics of OA. Talk about it with other members, especially your sponsor. Reflect on it as you read our Newcomer’s Packet. If you have an opportunity to 12th Step someone, this is a great way to do it. Share your membership with them, tell them your story, and if they’d like to know more, this video is a great resource for them. Have a newcomer or sponsee watch it by themselves to learn about the program. Watch it yourself and use it as talking points for working with others or sharing at a meeting. What Is an Intergroup, and Why Is It Like Canada Geese? Together, we can soar to new heights! If you’re like me, you’ve probably spent a lot of time avoiding Intergroup service. For years in program I told myself that whatever exactly it was that those Intergroup people did, it had no bearing on me—and I wasn’t a joiner anyway. Turns out that I joined Intergroup the moment I joined OA. It took me a few years to realize that Intergroup is all of us who attend meetings in the Seacoast! It isn’t the boss of anyone. It doesn’t dictate what meetings should do or tell members what they should do. Intergroup doesn’t govern. Trust me, the chairperson has no real power! What Intergroups do in OA is provide support for meetings, members, and even OAs in the making. Every Intergroup’s primary purpose is to carry the message of recovery to those who still suffer. A single meeting may have trouble getting the message to a lot of people at once, but when it joins with other area meetings it can do so much more. Intergroup’s job is to facilitate those collective actions. As an analogy, think of Canada Geese. Those V-formations you see when they migrate? Those huge flocks can fly 1,000 km in a day. A single goose won’t have enough stamina to get nearly so far. Even a small family of them can’t do it. But when the entire flock joins together, there’s enough geese that they can each take turns flying in the point of the V, sheering the wind for everyone else in the flock. 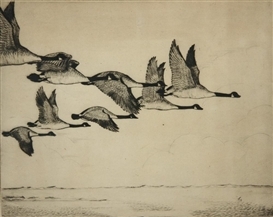 In this analogy we are each a goose; our meetings are the families; Intergroup is the flock. A 12th Step Within campaign. These things support all of us in some way. These actions aren’t likely to occur, however, if we don’t have an Intergroup to align our efforts. For example, the background work that went into developing the Year of Abstinence included a survey of our entire membership. Our workshops depended on our Intergroup having affiliated with OA’s Region 6, which allowed us to hear about and attend events where we made contacts that made the workshops possible. Planning, logistics, project-management, and simple business. That’s what the Intergroup is for. Our soon-to-be-finalized strategic plan demonstrates that we can be active and creative in getting the message out. It turns out that doing service at the Intergroup level isn’t what I thought it was when I was avoiding service. It’s not about attending an extra meeting once in a while to hear what the treasury’s balance is. It’s about doing our Higher Powers’ work to help others. And we get a nice spiritual jolt for doing it!